At last the curtain fell on the exemplary life of the Commandante of The Army of the oppressed and dis-inherited people world-wide. Fidel Alejandro Castro Ruz has passed on after 90 eventful years, 49 of which he held sway as the Prime Minister and later President of Cuba. 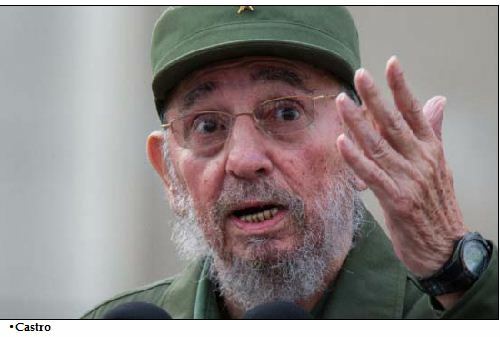 Indeed, Castro has become a permanent feature of political and ideologicsl discourse for more than five decades, such that we almost thought he would live forever. The feeling is mixed. Yes mixed! To lose such an inspiring and profound personality is eternally painful but for such a legend to depart at such a ripe age of 90, deserves a huge celebration in a world where average life span hardly surpasses 50 years, but not more than 70 years for men in the most advanced nations on our planet. On behalf of the Government and people of The State of Osun, and in recognition of the historical and cultural bond between the Cubans and Yoruba in the State of Osun in Nigeria and worldwide, we salute the courage, determination, vision, resilience and revolutionary zeal of Fidel and his companions, the indomitable spirit of Cubans, and Solidarity of all people of the world, committed to human dignity, freedom and happiness. From the July 26 movement of 1953, the Granma Expedition of November 25,1956, the ultimate victory of the revolution on January 1, 1959 and to his final departure from our realm yesterday night at about 10 pm, November 25, 2016, we are sure that our Commandante had lived a fulfilled life that history will never forget. Millions of people – students, academics, poets, politicians, trade unionists, artisans, revolutionary cadres and humanists – including my humble self, drew inspiration from him, his rhetorics, writings, reflections,dedication, integrity and commitment to building socialism.There is no doubt that the world is a better place because of him, consequently a gem has been lost indeed. He was a symbol of resistance to injustice and oppression as all the oppressed people of the world drew inspiration from him. He holds the unenviable record of the man who has had the most assassination attempts on his life, with none succeeding. He stood for what he believed in and not for once did he flinch in the face of the most formidable military encirclement and daunting economic and financial strangulation. Ironically, the man that the greatest powers on earth could not break, finally succumbed to illness and ultimately the cold hands of death, in the way of all mortals. As Africans we remember the solidarity, partnerships, high level of discipline and sense of DUTY of the Cubans to the liberation struggles, health care delivery, education, sports and youth development and political consciousness in Africa under the leadership and direction of Fidel and his administration. Although Castro’s Cuba is a nation with modest means but she has a gargantuan spirit of internationalism, support and assistance to the poor and exploited peoples and nations of the world. We proudly acknowledge the heroism of Cuba in this unparalleled show Solidarity and Humanism. Nevertheless, even in death, Castro has joined the pantheons of immortals whose ideas and praxis dominated and influenced their world and will therefore live forever in the hearts of people, in literature and politics and in the physical monuments that will be named after him all over the world. Millions will carry on the struggle, where he left. Fidel Castro has been rightly described by The Guardian of London as a ‘revolutionary icon’. It is expected that well deserved encomiums and heartfelt tributes will pour in for a life of struggle, Spartan discipline, selflessness and sacrifice that he lived. As we mourn and celebrate the passage of this international revolutionary legend, hero of the oppressed, fighter of oppression and exploitation, promoter of social justice, soldier and Commandante of ideas, we join the people of Cuba in their national grief and urge them to renew and redouble their commitment and duty to the struggle and ultimate victory of socialism. Fidel Castro has completed his earthly assignment but the ideas for which he struggled, defended, sacrificed, lived and died like his other immortal colleagues, will live forever.